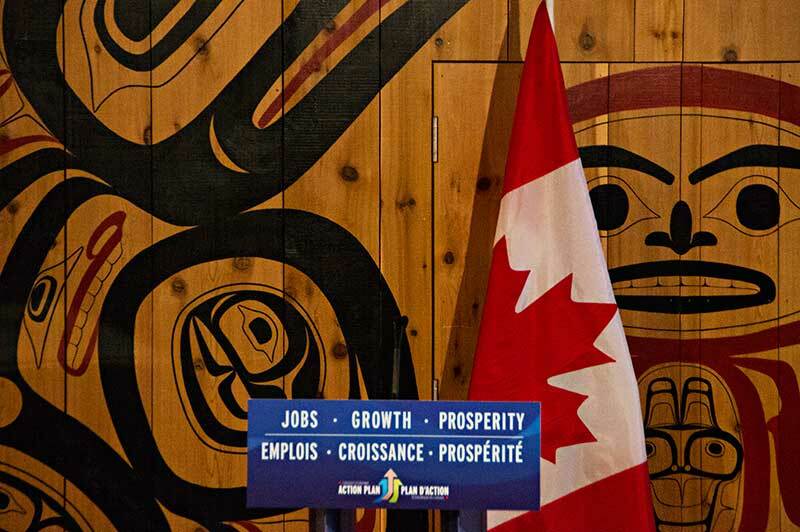 The documents reveal the priority for Natural Resources communications staff was mainly finding an appropriate First Nations visual backdrop for Oliver’s speech announcing the appointment of Douglas Eyford as special representative to First Nations, the Harper government’s attempt to smooth relations as it dawned on the government that opposition to Northern Gateway wasn’t just going to disappear. 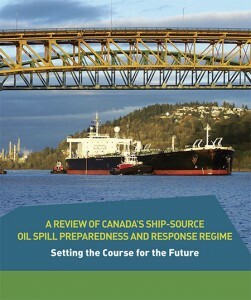 Despite years of media coverage from both those opposed to and even those who support the Northern Gateway project that highest priority issue was preventing oil spills whether from tankers or pipelines, the Ottawa-based communications planners in Natural Resources Canada were talking about how aboriginal and non-aboriginal communities could respond to oil spills. 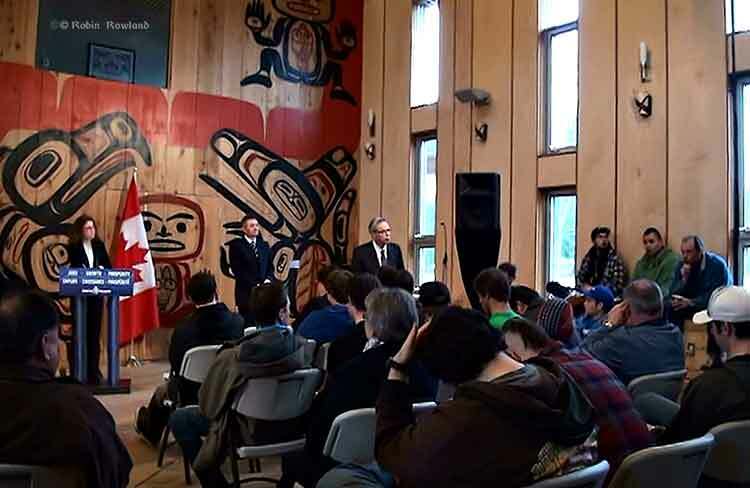 A visit to Kitimat, the centre of the debate, wasn’t even on the radar in March, 2013, as Joe Oliver, then Minister of Natural Resources, even though Kitimat is just a 40 minute drive from the site of the announcement at the Terrace campus of Northwest Community College. When Natural Resources Canada started planning Joe Oliver’s announcement they created what was called a “Message Event Proposal” which even in its title shows how the government and the communications staff think. The message is more important than the event. The documents show that there were no plans to involve “stakeholders” in Joe Oliver’s announcement. The first set of those events would eventually take place on March 18, 2013, in Vancouver, and included the announcement, without consulting either Rio Tinto Alcan or the District, that Kitimat’s private port run by Alcan since it was first built would be turned in a federal public port. The announcement of Eyford’s appointment would eventually take place at the Waap Galts’ap community long house at Northwest Community College in Terrace on the morning of March 19. That location certainly wasn’t clear at first. The first documents suggested the announcement take place in Vancouver, and then a day later on March 6, the proposed venue, according to the staff, was in either Prince Rupert or Prince George. According to the internal e-mails, sometime that week what Ottawa bureaucrats call MINO — the minister’s office– decided that the venue should be Terrace. On March 11, e-mails among Natural Resources staff show that the choice had changed to either Terrace or Prince George. The choice of Terrace left the Natural Resources Ottawa staff hedging their bets, looking for a “potential plan B” in Prince George. The e-mails indicate that Ottawa asked Natural Resources west coast communications officer for a list of suitable locations in Prince George. 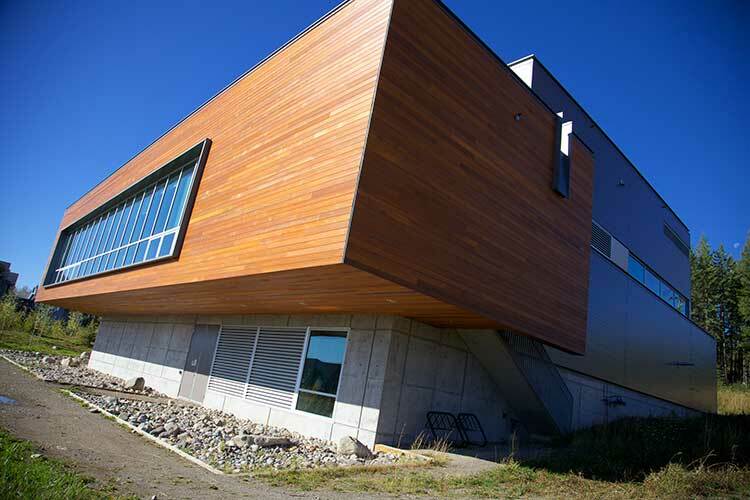 Backups were The College of New Caledonia trade centre and the Prince George industrial park. Remembering that Natural Resources and Transport Canada were also planning the Vancouver event on Monday, March 18, it appears that even as Oliver arrived on the morning of March 19, the minister’s staff both political and bureaucratic were still scrambling. On March 19, the NWCC staff on site were complaining that as soon as the Ottawa delegation saw the standard arrangements for an event at the Waap Galts’ap community long house they ordered the NWCC staff to immediately rearrange the room, so that the podium was in front of one wall with what Oliver’s staff thought was a better First Nations painting. That rearranging was still going on when I arrived to cover the announcement. Even after the furniture was rearranged, the start was delayed as Oliver and his staff disappeared into an upstairs room for a meeting before the news conference began, and Oliver announced Eyford’s appointment. During the question and answer session with the media during the news conference, the students that had essentially been brought in as props for the photo op and to help promote Northwest Community College’s industrial training program, began to ask questions. One student asked Oliver if Eyford’s appointment was going to replace “all talks” with First Nations about resource projects. The Natural Resources public relations staff tried to cut off one student, since the national media were waiting on a telephone conference call. To his credit, Oliver did answer the student’s question, saying Eyford’s appointment was not intended to “replace the independent, regulatory review.” He went on to explain the Northern Gateway Joint Review would continue its work and report at the end of 2013. What was Ottawa thinking? You too, can respond to an oil spill. If the aim was to engage the First Nations and other residents of northwestern BC, it is clear that the concerns of this region hadn’t reached out Ottawa. It appears from the planning documents for Joe Oliver’s trip to Terrace, that a main concern of everyone in the northwest, aboriginal and non-aboriginal, opponents and supporters of the Northern Gateway pipeline, preventing oil spills also wasn’t on the government radar, rather it was preparing and responding to oil spills. As part of the measures to strengthen Canada’s Marine Oil Spill Preparedness and Response Regime, the Government of Canada will strengthen the engagement and involvement of Aboriginal and non-aboriginal communities in preparing for and responding to oil spills. The “media lines’ issued by Natural Resources also outlined the Harper government’s attitude to the Northern Gateway, noting that Eyford’s appointment was independent of the Northern Gateway Joint Review, and went to indicate that the JRP was “conducting a rigorous, extensive, open, science-based assessment.” It adds that “we will continue to rely on the integrity of this process,” again showing how out of touch Natural Resources was (at least in talking points) since by March 2013, there was growing consensus in the northwest that the JRP had lost its credibility. The media lines also show that the Harper government believed that “Aboriginal consultations are fully integrated into the review process to ensure meaningful consultation occurs,” a position that most First Nations in British Columbia reject, insisting on meaningful consultations between the Crown and the First Nation. When Eyford presented his report to the Prime Minister in December, 2013, Eyford called for stronger action to engage First Nations opposed to new oil and gas pipelines. The 53 page report contained dozens of recommendations mainly concerned with a more open and principled dialogue with First Nations. Editor’s note: On the port issue, an RTA spokesperson noted that talks with the federal government are continuing. He noted that all the Kitimat port facilities are privately owned, by Rio Tinto Alcan or by LNG Canada and there are “multiple stakeholders” involved. One small step for the Supreme Court of Canada, one giant leap for mankind. A barely-noticed* part of the unanimous Supreme Court of Canada decision on Thursday recognizing the rights and title of the Tsilhqot’in First Nation to their traditional territory may—may— change the way resource companies operate, not just in Canada but around the world. The ruling isn’t just about consultation, reconciliation and accommodation, it’s about the future. While the ruling applies only to First Nations, it upholds the First Nations’ concept of “stewards of the land” for the future and thus could protect the environment for all future generations, aboriginal and non-aboriginal, in Canada and perhaps around the world. Aboriginal title, however, comes with an important restriction — it is collective title held not only for the present generation but for all succeeding generations. This means it cannot be alienated except to the Crown or encumbered in ways that would prevent future generations of the group from using and enjoying it. Nor can the land be developed or misused in a way that would substantially deprive future generations of the benefit of the land. Some changes — even permanent changes – to the land may be possible. Whether a particular use is irreconcilable with the ability of succeeding generations to benefit from the land will be a matter to be determined when the issue arises. While the Supreme Court ruling was about a case in British Columbia, where previous decisions have shown that in that province, aboriginal title was not extinguished at the time of European settlement and, what the court calls, “declaration of sovereignty,” by the colonial powers, the decision is already seen as applying to First Nations across the country where they can prove long term use of the land. Already there are those in the business community and among the conservative pundits who are raising the alarms about First Nations blocking resource development. Perhaps, just perhaps, some big corporations are quietly approving the Supreme Court decision because it gives responsible companies a roadmap for their operations, that roadmap will, as the years go by, reduce, not increase, uncertainty. Some companies, including the world’s biggest corporations are now thinking about the future. It is likely those companies are already planning new procedures and practices that will comply with the Supreme Court’s requirement of consultation and consent on First Nations’ traditional territory. In May, at an LNG event in Vancouver, I was speaking to a high ranking energy executive whose responsibilities cover half the planet. What changed, he said, was the rise of social media, Facebook and Twitter. “In one case five women in one small town shut down a project that would have been worth millions.” (He would not tell me the specifics and assured me it was true but he wasn’t prepared to give the details because it wasn’t his company that was involved). “Not all my colleagues agree with me,” he said, “But in the end it’s good for business, if we genuinely engage with a community, we actually save on costs and get into profit sooner.” He said that smart companies in the energy sector have staff constantly monitoring social media, not to identify “enemies” but so top management can be aware of growing issues that may complicate their future operations. This company generally, so far, has good relations with First Nations in British Columbia (although its record elsewhere in the world has been questionable at times in the past). If truly responsible resource and other companies either willingly or are compelled to change their practices and investment decisions on First Nations’ land so that those projects consider future generations, and still make a profit, (which my source says they can) then it is likely that the companies will then adopt those practices in other parts of Canada where Rights and Title are not an issue and then around the world. To use a marketplace phrase, it isn’t going to be “an easy sell.” For more than half a century now, the world has been plagued by the idea from Milton Friedman and other economists that a corporation has only one responsibility to its bottom line and “shareholder value.” With companies that still follow the no responsibility culture, comes the race to the bottom and the environmental degradation we have seen increasing in recent years. Business groups say the Tsilhqot’in’s approach to title threatens the economy. “A territorial approach undermines the ability of corporations, and indeed First Nations, to ensure the global competitiveness that is required to attract capital … within natural resource sectors dependent on the land base,” a coalition of B.C. business groups, intervening in the case, told the Supreme Court in its written argument. If those companies don’t change, as the years go on and the environmental crisis worsens, courts in other nations will likely cite the Supreme Court of Canada and force those companies to be responsible. In the long term, in the future cited by the Chief Justice, those companies that do work toward a true “benefit of the land” for everyone will have a competitive advantage, perhaps not in the coming years, but certainly in the coming decades. To use another phrase, respecting the rights and title of First Nations and the stewardship of the land will be a “net benefit” to Canada in the 21st century, even if the bean counters don’t believe it. Legal recognition of the concept of stewardship by a high court might also save the planet from total disaster. 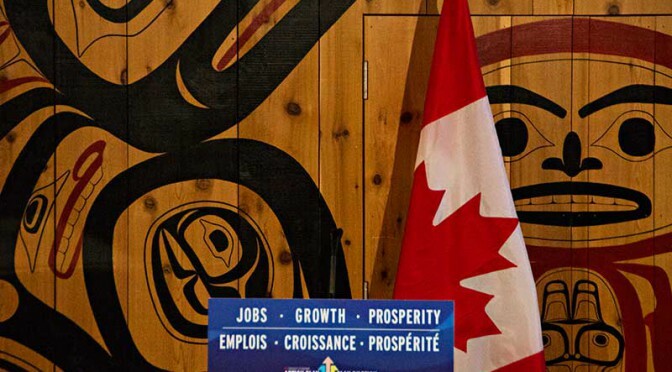 The Haisla Nation are calling on the federal cabinet to postpone its decision on the Northern Gateway project to allow time for adequate consultations with First Nations, according to the Haisla response to the Joint Review Panel, seen by Northwest Coast Energy News. The Joint Review Panel report and recommendations were released on Dec. 19, 2013 and the cabinet has 180 days from that point to recommend approval of the project. The Haisla argue that Section 54 of the National Energy Board act allows the Governor-in-Council, the federal cabinet, to extend the timeline if it wants to, if recommended by the Minister of Natural Resources. So far, the Harper government has refused to extend the deadline. The Haisla response document says Chief Counsellor Ellis Ross spoke to Minister of Natural Resources Joe Oliver on the telephone requesting the extension, but, according to the document, all Oliver did was point to the legislation that calls for the 180 day response to a joint review report. The Haisla response document also has a long lists of what the Haisla say are flaws in the Joint Review Panel report. 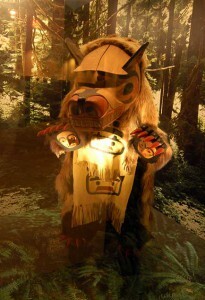 the process set out by the Government of Canada in the Aboriginal Consultation Framework was finalized after receiving and carefully considering input from Aboriginal groups….The Government of Canada believes the process outlined in the Aboriginal Consultation Framework provides for a deep level of meaningful consultation with Aboriginal groups with Phase IV being the final step prior to a decision being made on the Project. The Haisla dispute there has been any “deep level of meaningful consultation,” citing in the document a long list of attempts to engage the federal government with little or no response. The document lists attempts by the Haisla to engage with ministers and government departments including requests for a meeting with then Environment Minister Peter Kent, prior to the opening of the JRP formal hearings in Kitamaat Village in January 2012. Although the Haisla requested a meeting with Kent, several times in 2011, no meeting ever occurred. 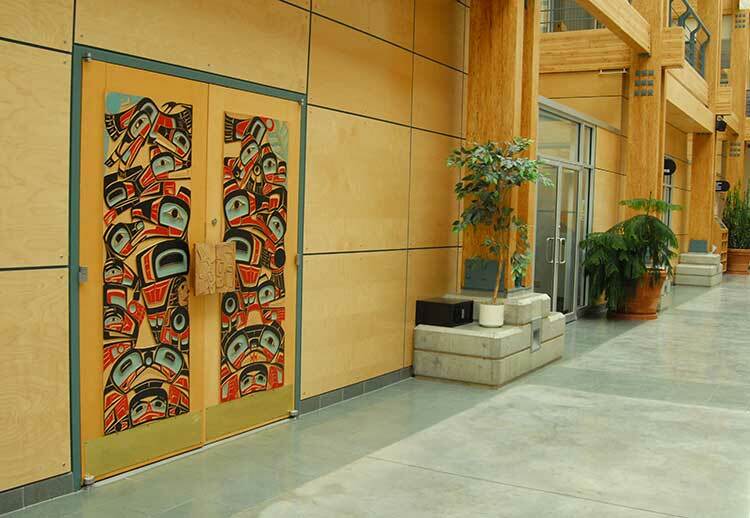 It was not until April 19, 2012, four months later that Kent replied to the Haisla saying he had asked the President of the Canadian Environmental Assessment Agency to meet with the First Nation prior to the start of the JRP hearings. However, it was apparently impossible to schedule such a meeting in December, 2011. Canada has yet to meet with the Haisla Nation to discuss the proposed project, other than to tell the Haisla Nation it is only engaging through the JRP process for now. This is not consultation. It is, perhaps, at best an initial step towards a consultation process. 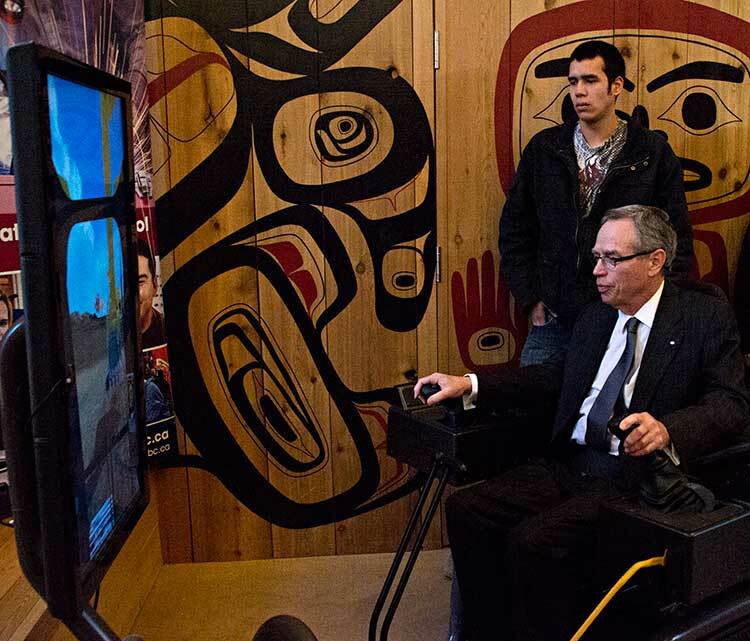 In March 2013, Natural Resources Minister Joe Oliver flew to Terrace for a photo op to announce the appointment of Douglas Eyford to consult First Nations on the Northern Gateway project. Oliver then flew back to Ottawa without meeting anyone in the region. Eyford’s report Forging Partnership Build Relationship was released in November, 2013. Mr. Eyford’s Report recommended that Canada should consider undertaking early engagement to address Aboriginal interests that may not be dealt within a regulatory process. 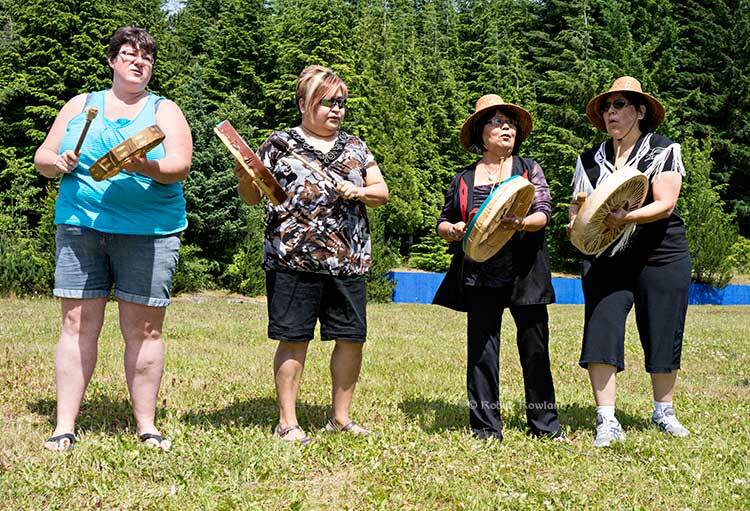 The Haisla Nation has been seeking such early engagement from Canada since the proposed project was first announced. Mr. Eyford’s Report also recommended that Canada should engage and conduct consultations n addition to those in regulatory processes, as may be required, to address issues and facilitate resolutions in exceptional circumstances. The Haisla Nation also asked for this, identifying early that this proposed project was an exceptional circumstance due to the significant potential impacts on the Haisla Nation. 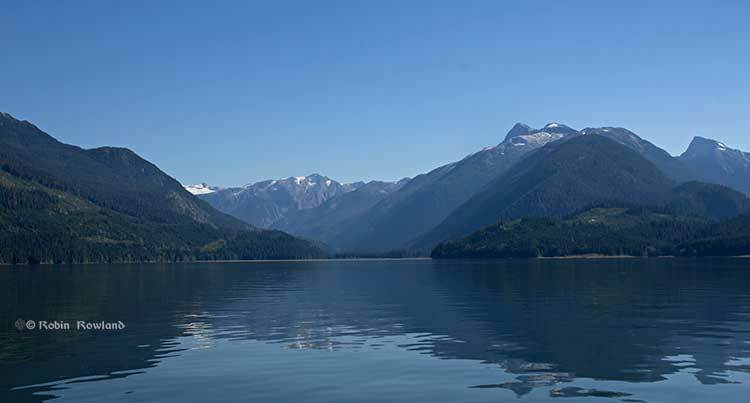 The Haisla Nation Council response was sent to Brett Maracle, Crown Consultation Coordinator at the Canadian Environmental Assessment Agency for the Northern Gateway project. The Haisla also sent copies of the response to Joe Oliver, the Minister of Natural Resources, Gaetan Caron, Chair of the National Energy Board, Leon Aqlukkaq, Minister of the Environment, Bernard Valcourt Minister of Aboriginal Affairs and Northern Development, Gail Shea, Minister of Fisheries and Oceans, BC Premier Christy Clark, Steve Thomson, BC Minister of Forests, Lands and Natural Resources and Mary Polak, BC Minister of the Environment. 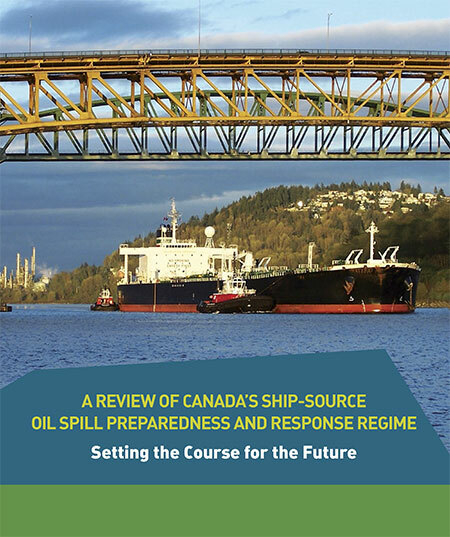 The possible effects of a bitumen spill on Pacific waters were not considered in the oil response preparedness report released last week by the Harper government, the background data study reveals. The consulting firm that did the study for Transport Canada, Genivar Inc, had no reliable data on the effect of a bitumen tanker disaster—because, so far, there has been no major ocean disaster involving diluted bitumen. Instead, Genivar, based its findings on potential hazards and response on existing data on crude oil spills. The question of how bitumen might behave in the cold and choppy waters of the North Pacific was hotly debated during the Northern Gateway Joint Review hearings earlier this year. Enbridge Northern Gateway based its position on laboratory studies, studies that were challenged by environmental and First Nations intervenors, pointing both to the unknowns of the ocean environment and the continuing problems Enbridge has in cleaning up the spill in the Kalamazoo River in Michigan. Genivar tried to base its report to Transport Canada on existing data on oil spills and related hazards. What it found instead is that that there are often gaping holes in the reporting and monitoring of oil spills world wide, especially small and medium sized spills. Lack of data also meant that Genivar had little to go on when it calculated the effect on an oil spill on key areas of interest to northwest British Columbia, the recreational fishery and tourism. Genivar, however, did uncover disturbing data about the long term effects of oil spills, studies that show even minute amounts of remaining oil can still disrupt the marine environment 40 years after an event. 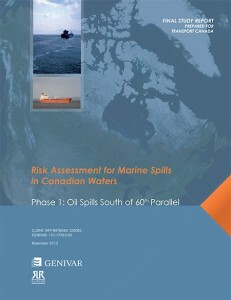 The Genivar report, Risk Assessment for Marine Spills in Canadian Waters Phase 1: Oil Spills South of 60th Parallel, was completed in November, then passed on to the “expert panel” that released their own report: A Review of Canada’s Ship-source Oil Spill Preparedness and Response Regime — Setting the Course for the Future. That second report was based not only on the data provided by Genivar but on the expertise of three panel members, their visits to some locations and input from government, industry, First Nations and municipalities. Transport Minister Lisa Raitt and Natural Resources Minister Joe Oliver unveiled the second report at a glitzy media event in Vancouver on Tuesday, December 10. At that time the expert panel report was released to the media along with an abstract of the data. The actual data report was not posted; it had to be requested through the Transport Canada website, which is how Northwest Coast Energy News obtained the background study. 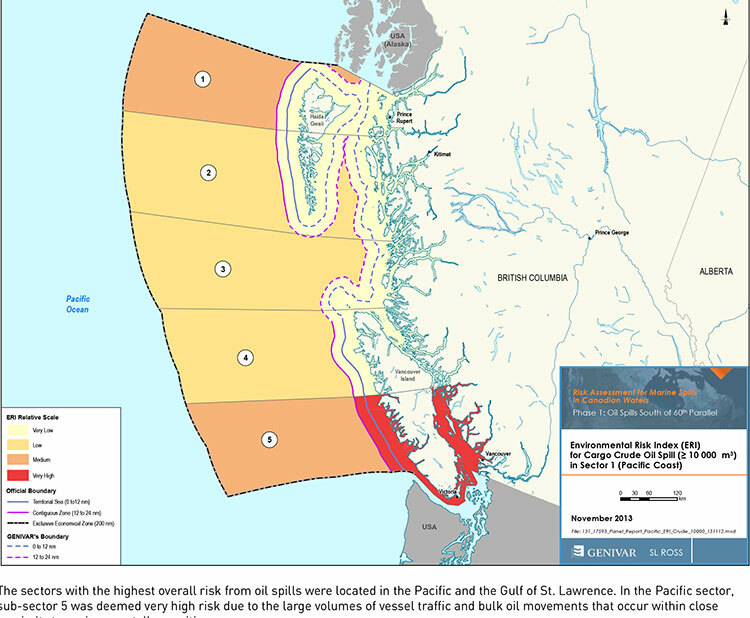 The expert panel found “a very high risk” of oil spills in two areas of the Pacific Coast, in the north around the ports of Kitimat and Prince Rupert and in the heavy ocean traffic area of southern British Columbia, especially Port Metro Vancouver and into Washington State. The expert panel made 45 recommendations that covered a wide range of issues including eliminating the present $161-million liability limit for each spill and replacing it with unlimited liability for polluters, annual spill training involving the Canadian Coast Guard, Environment Canada, provincial and local authorities and the private sector, increased and improved annual spill training exercises, basing risk assessment on local geography and conditions and faster emergency responses to spills. The science and technology around both the movement of oil and spill response has advanced significantly over the past several decades. We feel that while some aspects of the Regime have kept pace with these developments, in some areas, Canada has fallen behind world-leading countries like Norway and France. This can be attributed to a general lack of investment in research and development as well as the lack of coordination between industry and government over research priorities. The Government of Canada should work closely with industry to establish a national research and development program for oil spill preparedness and response. The program should be co-funded by industry and the Government, and the research priorities should be set through a collaborative process that involves academia, where possible. Like the Regime itself, we view this program as a partnership between industry and government. We envision that this program would also seek to leverage the work being done internationally on oil spill preparedness and response. The program should seek to establish partnerships with other world-leading countries in order to stay current on international advances and new technologies. The expert panel, however, does not say how the federal government is expected to pay for meeting BC Premier Christy Clark’s condition for a “world class” spill prevention and response system at a time that Finance Minister Jim Flaherty is determined to balance the budget and the Harper government is continuing to cut back government services. Pacific sub-sector 5. They are not modelled as a separate category in this spill behaviour analysis but are represented as “persistent crude”. Changes in spill behaviour depend to some extent on the environmental conditions at the time of the spill, as described in greater detail below. However, over the range of wind and sea conditions typically experienced in the Canadian marine environment, changes in oil properties are not overly sensitive to variations in climatic values, so a single set of wind and sea conditions will be used in the analysis. The idea that “changes in oil properties” not being sensitive to variations in climate was also frequently challenged before the Joint Review Panel. On the increase in traffic volume if the Northern Gateway project goes ahead, the Genivar report says. Enbridge Inc. has proposed to construct a marine terminal at Kitimat, B.C. and a dual pipeline from the terminal to oil sands production in northern Alberta. The terminal would handle up to 193,000 barrels/day of imported diluents (i.e., low-gravity condensate) that would be piped to Alberta and used to dilute bitumen to enhance its flow properties. The diluted bitumen would then be piped to Kitimat at rates up to 525,000 barrels/day that would be shipped by tanker to export to markets in Asia and California. At full capacity, the import of diluent and export of diluted bitumen would total up to 35 Mt/year. This amount is comparable to the currently-shipped volume in the Pacific sector related to volumes being exported from Vancouver and related to volumes being exported from the Alaskan to Washington State trade. To study the effect on an oil spill on the fishery, Genivar used data from the Department of Fisheries and Oceans as the provinces to gauge “the port value of commercial fishing and the value of the fish, shellfish and aquaculture” in each zone it studied and then compared it to the the national averages for commercial fishery. Those figures included any commercial fishery by First Nations. It is important to highlight that this indicator does not consider recreational or traditional fishing. The importance of this industry is notable and an oil spill could damage the recreational fishing stock as well. However, the absence of comparable data and the fact that this study is restricted to federal and international data, and some provincial data from Quebec and Ontario for commercial fisheries, limits the ability to include recreational fishing… Nevertheless, as an absolute index, it will provide an overall vulnerability in the event of an oil spill. The ongoing impact of cutbacks at Fisheries and Oceans has had a continuing impact on the northwest, especially in the controversial halibut recreational fishery, where DFO has admitted that it is basically guessing the size of each year’s recreational halibut catch. intensity index” so that Genivar could create what it calls the Human-Use Resource Index (HRI), even though that index appears to be based on incomplete data. This is an open letter regarding the 21 October 2013 report, entitled Recovery Strategy for the North Pacific Humpback Whale (Megaptera novaeangliae) in Canada, from the Department of Fisheries and Oceans on a recovery strategy for humpback whales in Canada. As you are likely aware, it is part of the DFO’s mandate to help this species recover from a century of whaling that nearly drove the species into extinction. The report identified four areas of “critical habitat” for humpbacks, one of which is at the mouth of the Douglas Channel, the gateway from Kitimat to the Pacific Ocean. The report also identified vessel traffic and toxic spills as two of the greatest threats to the recovery of this species. Thus, it was with shock and dismay I recently learned of the decision by the federal joint review panel for the Northern Gateway project to ignore the report as evidence in its ruling, as though vessel traffic and the potential for toxic spills were not two of the primary environmental concerns surrounding this proposal. It is particularly stunning given that the report, submitted to the panel last week, was authored by a federal government agency, and yet the federal government is now saying it refuses to take into account its own information when ruling on this project. It begs the question of why we even have a federal government agency devoted to ensuring the health and viability of our fisheries and our waters when the research and recommendations they produce are ignored by the very same federal government. The purpose of the joint review panel hearings is to weigh the available scientific evidence in determining whether this project will negatively impact habitat and endangered species. The purpose of the work of the DFO is to ensure that information is considered when the government is weighing projects which will impact habitat and endangered species. The decision by the JRP to ignore the DFO report is not only wasteful indifference; it’s a double-play failure and abrogation of the duty of both of your departments to protect endangered species and our natural environment. I wish I could feign some measure of surprise on this matter. But like many Canadians, I have come to see this kind of negligence as not only a passing tendency of the Conservative government but as a very intentional aspect of the government’s resource and environmental policy. When the government of Canada ignores its own science on endangered species protection, it’s no wonder why Canada has lost all credibility on environmental stewardship among both its own citizens and the international community. Natural Resources Minister Joe Oliver made a brief visit to the Kitimat area on Tuesday July 23, 2013, meeting Haisla Chief Counsellor Ellis Ross. 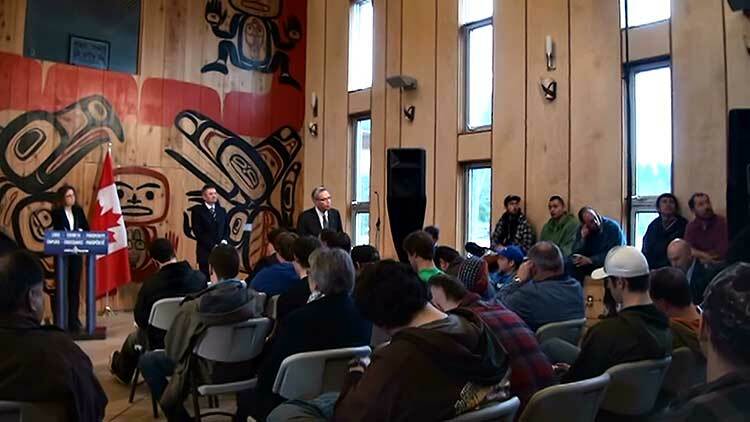 In the original planning for the visit, Oliver was not scheduled to meet with District of Kitimat Council or other members of the community, snubbing Kitimat in only his second visit to the region since he was appointed minister after the 2011 federal election. A half hour meeting with available members of the District of Kitimat Council was squeezed in only after intense lobbying from Mayor Joanne Monaghan. The Natural Resources department public relations staff also chose to ignore (or exclude) local media, with the exception of the Northern Sentinel. Northwest Coast Energy News, Kitimat Daily, CFTK and CRFN were not informed and did not accompany Oliver on his hour long tour of Douglas Channel. Minister Oliver discussed opportunities to increase First Nations’ participation in resource development and received a tour of the Douglas Channel hosted by Chief Councilor Ellis Ross. The Northern Sentinel reported that Oliver mainly concentrated on liquified natural gas development and tried to avoid questions about the Enbridge Northern Gateway project. Oliver repeated the federal government’s position on safety outlining the programs announced last march to expand pipeline expansion and increase penalties for safety violations. On LNG, Oliver told the Sentinel, “These are decisions made by the private sector, it’s not us telling us don’t do this project…they’re going to figure that out themselves,” he said. Councillor Mary Murphy told Northwest Coast Energy News that she was told by a Haisla friend early Tuesday morning that Oliver was coming to visit Kitamaat Village and immediately informed Mayor Joanne Monaghan. Councillors Mario Feldhoff, Phil Germuth and Edward Empinado were unable to attend because they working at the time and could not get away with such short notice. Sources tell Northwest Coast Energy News that even pro-development members of the local business community were not informed about Oliver’s visit. Murphy described the meeting “as very beneficial to us.” A couple of other sources, familiar with accounts of the meeting, however, both told Northwest Coast Energy News there was barely enough time after formalities to ask questions of the minister before he dashed out the door for the airport. Oliver last visited the region in March, to make an announcement in Terrace. At that time he did not visit Kitimat. Five days after the announcement that the private port of Kitimat will become a public port under federal jurisdiction, Transport Canada is now promising to consult District of Kitimat officials as the Douglas Channel waterfront transitions to a public port. Both Kitimat Mayor Joanne Monaghan and Economic Development Officer Rose Klukas, after numerous calls and attempts over the past few days, finally spoke to different Transport Canada officials Friday. According to the mayor, both were told that Kitimat will not become a public port for at least one year because the change from a private port to a public port requires a change in legislation. (Something Transport Canada may only just be realizing since Bill C-57, introduced Monday to cover all the changes for what the Harper government calls a “world-class” tanker policy makes no mention of Kitimat). Transport Canada says that beause there are no federal lands in the Kitimat harbour, the amending legislation will only cover navigable waters in Kitimat. But it looks like the fees charged to incoming ships by the federal government could be causing a headache for Rio Tinto Alcan. Claudine Gagnon, an RTA spokesperson based in Shawnigan, Quebec, told Radio Canada, the French language network of the CBC, that the company is trying to assess the impact of the announcement on its operations in Kitimat. Among other things, the change in the port’s status could result in higher transportation costs for the company. Google translate of Radio Canada story. At this point, Transport Canada officials told the District is unlikely that there will be Port Authority in Kitimat like the one in Prince Rupert. Asked about the port announcement during a post budget news conference on Thursday, Skeena Bulkley Valley MP and NDP House Leader Nathan Cullen said, “I’m as surprised as everybody in Kitimat is. I’ve been phoning around to local leaders to find out if anyone had been consulted or spoken to about this. And it’s a shock for everyone including people from Alcan. “This doesn’t make any sense at all. The conversation around a public port is a good one and one we need to have and we’re open to the idea, but what a terrible start to the process, when a minister flies in from Ottawa, announces something, doesn’t tell any of the local government about it and then expects everyone to pop the champagne corks. You want to get this thing right. You want to make sure the public interests are met. “There’s a real arrogant feeling, when a minister flies in from Toronto and says this is how it’s going to be and there’s no need to talk to anyone in the region about it. Cullen was also asked about the provisions in the safe tankers announcement on Monday by Transport Minister Denis Lebel and Natural Resources Minister Joe Oliver that the federal government appears to be taking over responsibility for navigation aids on the British Columbia coast, something that until now, Enbridge Northern Gateway has said they will pay for. 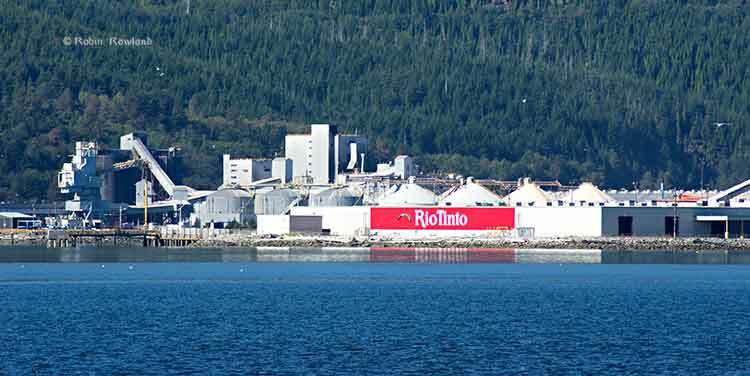 The announcement Monday that the federal government intends to turn the private port of Kitimat into a public port, an announcement confirmed by Natural Resources Minister Joe Oliver in Terrace, Tuesday, came as a surprise to Rio Tinto Alcan, which now operates the port. This announcement was not discussed with Rio Tinto Alcan in advance. We are endeavoring to have meetings with the federal government to gain clarity on this announcement as it specifically relates to our operations in Kitimat. On Wednesday, Kitmat Mayor Joanne Monaghan told CFTK news the community was never consulted. Monaghan told CFTK she still hasn’t been able to get anyone with the federal government to tell her more about the plan. Since today, Thursday, is budget day, it is likely that federal officials would be unavailable for further comment until next week. Another point that is unclear from Monday’s announcement is whether or not the federal government fully intends to take over the navigation aids and enhancements on Douglas Channel and the BC Coast. If so, that means that the Canadian taxpayer would become, at a time of budget cuts, responsible for millions of dollars that Enbridge Northern Gateway has consistently said that the company will pay for. 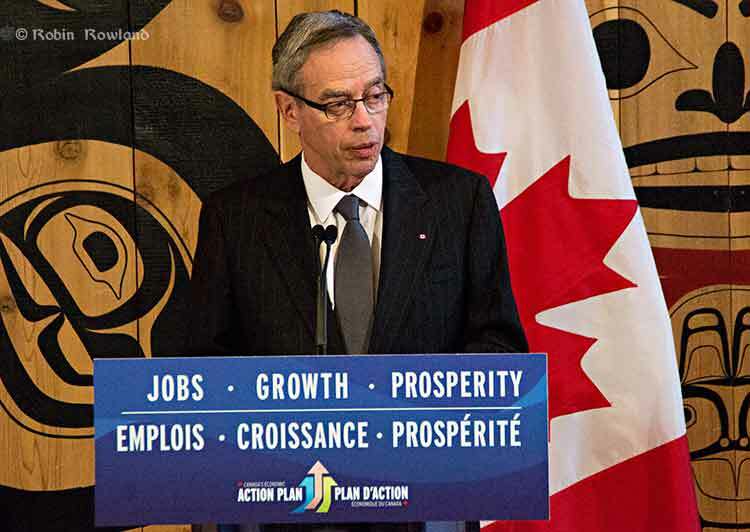 Joe Oliver, the Minister of Natural Resources, has confirmed that the federal government intends to make Kitimat a public port. Oliver was asked to confirm statements on the Transport Canada website that Kitimat would become a public port. The federal budget will be released on Thursday. At Monday’s meeting of District of Kitimat council, some members quietly expressed frustration, to say the least, that Oliver, the man responsible for pushing the Northern Gateway pipeline through British Columbia to Kitimat had not bothered to include the town in his visit to the northwest. 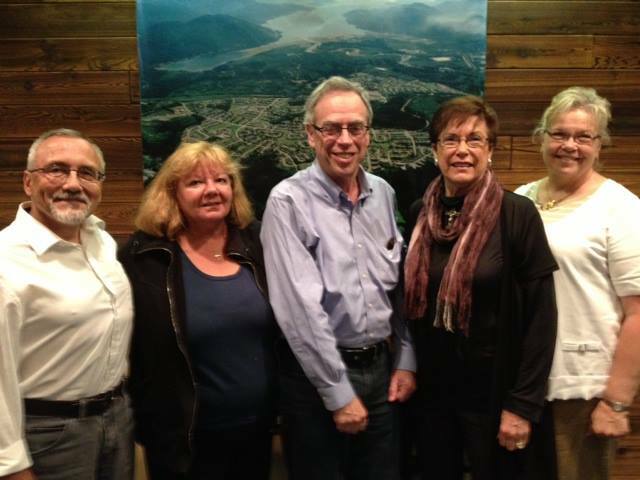 Members of the District of Kitimat council, which on paper at least, is responsible for the port of Kitimat (even though it is really run by Rio Tinto Alcan) also expressed frustration that no one in Ottawa gave the council advance notice of the government decision to take the port public. Asked for comment on Oliver’s statement, Rio Tinto Alcan officials in Kitimat also seemed unaware of the government announcement and promised a statement in the near future. Oliver’s announcement in Vancouver Monday about a “world class” marine safety system and today’s announcement about the appointment of Douglas Eyford, appear to be a campaign by the Harper government to establish a stake in the middle ground in the pipeline debates, in hopes of undermining the opponents of the projects. Skeena Bulkley Valley MP Nathan Cullen, in a news release, expressed reservations about Eyford’s appointment. “The primary concern with the appointment, Cullen said, is that Mr. Eyford will report to the Prime Minister, not to Parliament or the public. “So, if Mr. Eyford’s report is in any way unfavourable to the Conservative pipeline agenda, what assurances do we have that his report will make its way into the public eye?